Enjoy crystal clear audio thanks to the included quality headphones. 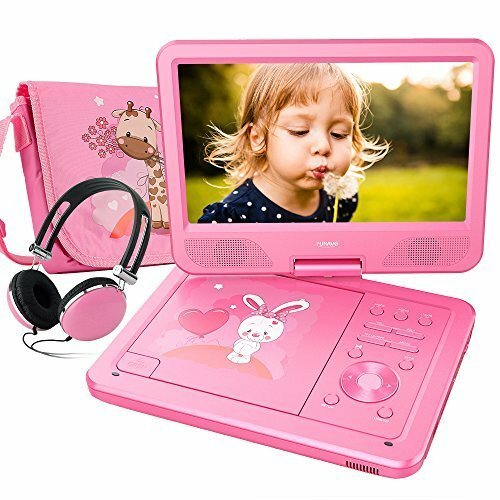 The matching carrying case makes it easy for you to carry our DVD player anywhere you want and provides additional storage. Leave the power wires at home. With this improved battery, we extend the play time to 5 hours. So now it can keep you entertained for longer and you won't have to worry about losing battery power suddenly. Thanks to a built-in USB port and SD card reader, you can enjoy digital movies and MP3 files directly from a USB flash drive or SD card. Even when traveling on a gravel road, the shock resistance function will allow you uninterrupted viewing. We believe in our products. That's why we back them all with a 12-month warranty and provide friendly, easy-to-reach support. Don't hesitate to contact us if you have any problem. SWIVEL SCREEN: Never be stuck for a viewing angle as the 10.5-inch 1024*600 swivel screen with 270-degree rotation and 180 degrees flip allows you to get the perfect view every time. It can be easily swiveled and attached to the car headrest when you are on road trips. MULTIPLE WAYS TO PLAY: Need it bigger? The AV input and output allow it to be connected to a TV for you to enjoy for favorite movies on a big screen. Two like DVD players can also be connected by an AV to AV cable so that the same movie can be watched on two players at the same time. If you have any questions about this product by FUNAVO, contact us by completing and submitting the form below. If you are looking for a specif part number, please include it with your message.